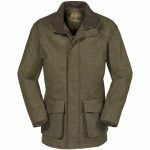 The right shooting jacket makes a huge difference to your day’s shooting, especially given the uncertain twists that the British weather can throw at us! The array of options has become bewildering, so in this blog we are going to try and help you understand some of the complexities to enable you to make the appropriate choice. Tweed is about the most traditional of shooting jacket fabrics. Traditional tweed checks were designed with colour combinations to help the wearer blend in with their surroundings; effectively an early version of camouflage. This is still true today, but the construction of the tweeds has now advanced considerably. Starting with a completely traditional tweed; this would be made from a pure lambswool that was woven so thickly and tight that water could not get through. Wool expands as it gets wet, causing the tweed to lock itself even tighter – so that water really couldn’t penetrate to the inside. There are plenty of tweeds of this construction still available, and a well woven tweed will keep you dry and certainly keep you warm. The downside to this type of fabric is that it is heavy, and as it absorbs water it gets even heavier; so, by the end of a long, wet day you’ll really know you’ve been carrying it around. It may also take several days to truly dry out again. Full waterproofing – achieved by incorporating a lightweight breathable lining. Hydrostatic finish – a coating on the wool that is totally invisible and means that water rolls off the fabric, rather than sinking in. Nylon – instead of being 100% lambswool, there is a small element of nylon (3%). Nylon is incredibly tough, adds strength and holds the shape of the garment. In combination these 3 features mean that a lighter weight construction can be achieved with the tweed, so you don’t have to drag such a weight around with you. The most recent advancement in tweed is to create fabrics that are machine washable. These fabrics basically take the technical tweeds to the next level. There are several different ways this can be achieved; from pre-shrinking the wool to a ‘plasticification’ process that protects the tweed when washed. Musto, Schoffel and Barbour all have jackets which incorporate this type of fabric. Ultimately, tweed is still considered the smartest look in the shooting field, and a must-have for a certain type of day. Advances in the construction of the weave mean that you can now get tweeds that are both smart and comfortable. Breathable fabrics have been around for many years now, and the market is still lead by GORE-TEX® due to the degree of breathability it is able to achieve. 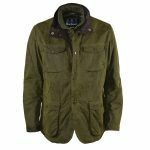 Breathability is probably one of the most important factors in a jacket; if a fabric traps sweat next to the body, not only will you end up wet inside the jacket, but you’ll also feel the cold much quicker. There are a huge number of products on the market that are waterproof, and a significant number that are also breathable, however there are different degrees of breathability. The leading breathable fabrics allow sweat to escape much quicker than some of the more basic membranes, and this should be considered when choosing between breathable jackets that on the surface may appear very similar. 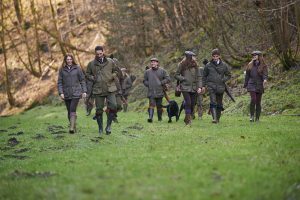 Breathable fabrics for the shooting field tend to come in a variety of shades of green; providing more of a universal country style than tweed. In some forms of construction the outer fabric is the breathable membrane, and in others the membrane is protected inside the coat, with an outer layer that is generally designed for durability. 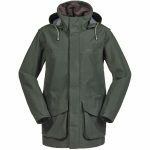 The first shooting jacket on the market to ever feature GORE-TEX® was Musto’s Highland Jacket. That was over 25 years ago, and it remains one of the best jackets available on the market; especially for those who are out in extreme weather conditions. The last common category of fabric is wax. Wax isn’t breathable, but correctly maintained it is waterproof, and will last many years. Before the advent of breathables, wax was the dominant fabric in the shooting field. Today wax is still hugely popular, but more as a fashion garment rather than for its technical performance properties. Wax is still a hugely versatile fabric, and for those of you who work your jackets hard in ‘the rough’ it is still a great option, but without the breathable properties it’s generally no longer favoured for shooting. There we have it, a brief tour of the main types of shooting jacket fabrics. Keep an eye out for our final instalment of this 3-part series, coming soon!